It’s been so hot here lately, as it is pretty much everywhere the past few weeks. The heat is the only part of summer I really don’t like. If it could be 75 every day and I’d never complain again (at least not about the weather.) I’d even trade in my 5 snow days for 75 degrees every day. Today we stayed inside and played a lot of games…Tweedle Ian and I played two Cranium games (Dice and Cadoo) while Tweedle Dee was hanging at her friend’s house. Tonight after dinner we all played games together. 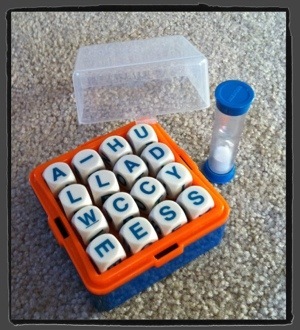 My kids love Boggle. I love that they love it. This game is obviously good for spelling and reading skills. Tweedle Ian has finally figured the word family and plural strategies and is in it to win it these days. I see a 6 point phrase. Do you? While this game is good for very small groups sitting around a table, there are some computer games and apps that use the same concept and reach more learners at a time. 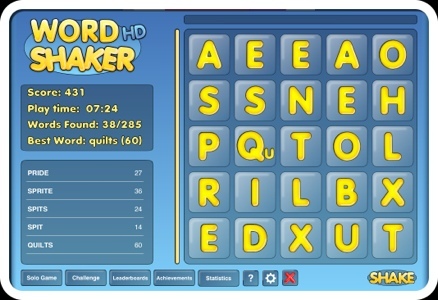 A personal favorite is a great web-based game, Letter Blocks, that we play on the SMARTBoard and trust me when I say it is addicting. I have used this game at the end of the period as a reward for hard work. I have left this link for the substitute in case my plans run short or if he/she needs something for my intervention study hall. I also have a link to this game on my page on Edmodo. If a student wants to play this game during study hall or at home they can (and they do). My own kids play this game on the weekends if we go into school for a few hours. I’m a big word-game fan, and I really love some of the anagram games out there. Word Waggle is a good one but I’ve come to love Polywords as it also has a dictionary where you can look up some of the more obscure words that are accepted. I’m currently writing a series of posts on word games after a friend requested some for her daughter (so far only word search has been posted). The ones I’d really love don’t seem to exist. 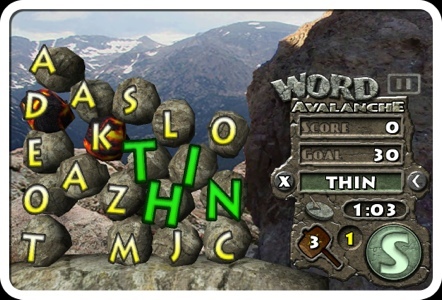 I want to be able to put in custom word lists, such as weekly spelling, to generate hangman games, word searches etc. If you come across any that do that, do let me know. I haven’t tried the ones you mentioned so I’ll look out for them. As for board games, I’ve managed to score some free games of Chess, checkers, Ludo, snakes and ladders and yatzee, and I also bought some of EAs board games (Game of Life, Monopoly etc) over Christmas when they had them on sale for 99c. Thanks for a really interesting post. Way to score on the board games! (No pun intended!) There are always great deals at Christmas time. And at that price you could permanently modify a game board to fit certain content and not feel guilty. I am familiar with Spelling City and there os a way around it. I did a review on my blog of an App called Rover that lets you access educational flash sites. It filters out the non-educational ones. Haven’t yet foun a cross word app I can use custom list with, but I do use My Spell Test and School A to Z to create custom spelling activities for my kids. Reviews also on the blog. The School A to Z one is free and Rover is free also. This Rover app sounds like a great thing. Gonna check it out! Thanks for the tip! Loving these ideas!!!! Thank you! Thanks! Remind me again, what grade do you teach?